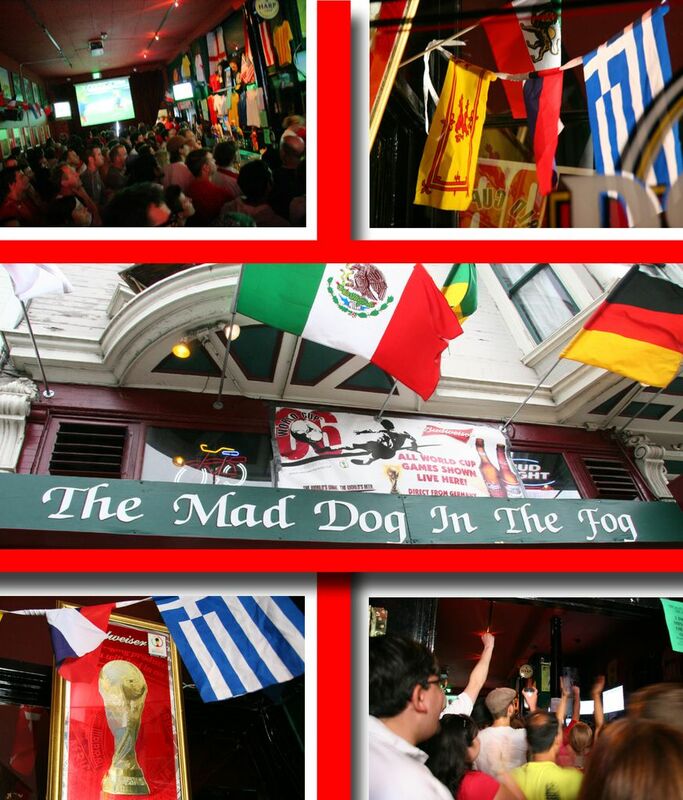 Where to Watch World Cup Football in San Francisco, Take 3: England! I guess I went to Mad Dog, looking for a little piece of England. Hoping that it would help me remember some part of myself long since left on the other side of the Atlantic Ocean. It's a really friendly pub with great staff. The female waitresses, who were delivering beer orders into the crowd, deftly balancing huge trays of bottles above their heads as they snaked their way through the jostling, exciteable footie fans, carried out their job with remarkable patience, sharp wit and humour. The place was full of English people, But! Despite England's win, I left the pub with an empty feeling. I had watched the game amongst strangers. Simply being Enlgish wasn't enough to knit a feeling of special camraderie between me and the rest of the anonymous crowd. I mean, let's face it, the miserable buggers didn't even laugh at my t-shirt. What the hell kind of English people were they anyway? Archive Alert! On this day in 2005: Cafe 222, San Diego. I will certainly be looking out for it! You don't know how much England football fever has infected this American ex-pat! They didn't laugh at your t-shirt? Tsk tsk. that's a great t-shirt. I would have laughed. But I also think the mad dog int he fog is overrated and not really very english at all. actually the most english pub I have found is the Pelican Inn near Muir beach but it is also a very chi-chi english pub - not a footie watching pub. Me I'm hoping to go over to my english friend's house (or maybe my dutch friend's house) and do something similar to you. 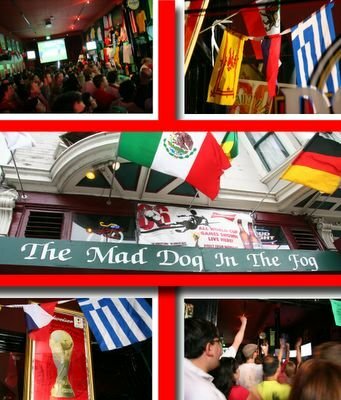 I go see France play at the mad dog. There were quite a few official team jerseys with Zizou on the back yesterday. THREE-TO-ONE!!!!!! The mad dog is like toronado, you can bring in your rosamunde sausage. I think that's where your empty feeling is coming from: rosie is closed at 8am on Sundays. My father, who is from Bethnal Green in London, and I, go to the Mayflower Pub in San Rafael. We always watch England's games there, as well as eat a very tasty full english. Actually, it's missing the tomatoes, but whatever, the beans and chips are great. During the World Cup, it has been packed full of England jerseys and flags draped over shoulders. Pop in for a pint, proper breakfast, and the destruction of Portugal. Cheers! sorry to say this, but fred does have zidane going for him - the guy can play some mean football! You might try Kezar on Stanyan, too. That's where I catch rugby matches. And, man, are they rowdy. Marmite on toast...you're cute. I love football and I love England after living in London for a year during college. My husband and I went to the only British pub we could find in Fort Lauderdale to watch the game, but it was so packed they had shut the doors before it even started. All in all, I had a much better time watching at home. This weekend, I'm going to make an English breakfast which for me just involves a grilled tomato, pour a guinness and enjoy it. An England/France match up would be fantastic. On my blog I'm also doing a "World Cup Dinners" game where I pick a match and cook a dish from the country of the winning team. It's been really fun and I'm hoping for the chance to do some banger n'mash or sheperd's pie. Have fun watching the games! *sigh* I am so out of the loop this season. I haven't watched a single game. Andrew - you are taking on the characteristics of the London media far too much in your new careers! And if you are going to believe in portugal then you should be having some of that quince drink they have there. plus grilled sardines. What are you saying Owen??!! I love Sardines but quince drink(?) sounds far too healthy for me! Jess - I am sure it is going to be crazy quiet on the streets of london and crazy noisy inside the pubs! Dagny - maybe it was too much to ask? Owen - was that The Chieftan? I was considering going there - they are good during the rugby. That's where I saw England win the world cup. Ced - you have a point about the sausages - they would have filled me with something, that's for sure! Kishko - a true brit can get away with beer OR tea or even beer AND tea. Andrew - I will be force feeding you marmite with a spoon if you are not careful. Julie - i like the english breakfast at home idea a lot. I am going to check out your world cup dinners. thanks for the tips. Andrew - just hope it's an alcoholic version! hey McAuliflower - fred is stillin with a chance, hopefully there will not have to be any condolences for him!